Measurement methods using ultrasound waves have been successfully employed in materials testing as well as medical diagnosis for a long time. Unlike medical ultrasonography, quantitative ultrasound (QUS) methods are not primarily used to obtain images from the inner human body but to measure quantitative parameters by which to assess tissue properties. 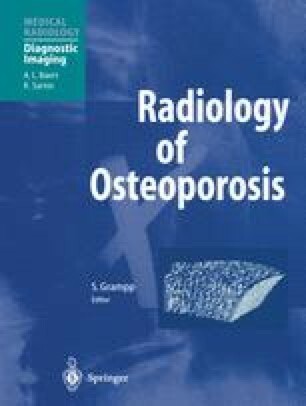 In recent years interest in methods of QUS for the assessment of bone properties has increased and many devices are now in use in clinical practice. QUS devices are less expensive and smaller than axial dual-energy X-ray absorptiometry (DXA) or quantitative computed tomography (QCT) devices and do not require the use of ionising radiation. These advantages explain the motivation for using QUS devices for the assessment of osteoporosis, assuming that performance is comparable. However, QUS is not just a cheap surrogate for measurement of bone mineral density (BMD). Ultrasound propagation is complex and affected by other properties of materials, as X-rays are. Ultrasound waves are affected not only by the amount of material but also by its elasticity and structure. For this reason, QUS might be able to yield additional information about bone fragility.